Still, there have always been substantial minorities who, whether on religious or other grounds, refuse to accept the Englishman’s ideas. Take the United States, long seen as a stronghold of ideas that challenge Darwin head-on (by insisting that the Biblical account of a six-day creation is literally true) or in a more indirect way by insisting that the process of evolution must have been guided by some higher, intelligent power. 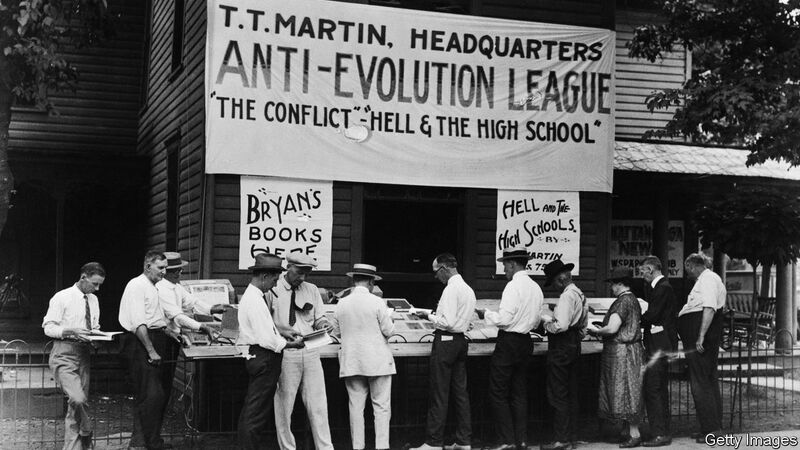 Some court decisions have effectively barred the teaching of theories other than evolution in public schools. But clearly many Americans grow up with very different ideas, imbibed through faith-based educational establishments, home-schooling or Sunday school. How many, though? Pew, a pollster and research body based in Washington, DC, has just published an essay showing that the number of hard-core creationists (defined as those who assert that human beings have always existed in their present form) appears to vary depending on how the questioner broaches the subject. In one approach, American respondents were given a choice between the proposition that life forms had evolved over aeons of time and the statement that humans, at least, had always been the way they are now. Some 31% opted for the latter statement. But a different picture emerges if people are given a three-way choice: between the idea that life evolved with natural selection alone; the idea that evolution did happen but was guided by a high power; and the insistence that humans have never changed. To that challenge, only 18% adopt the hard-core creationist line, while 48% believe in divinely directed evolution and 33% in natural selection alone. Even among evangelical Protestants, assumed to be the most theologically conservative segment of society, the line of questioning matters a lot. Some 62% are prepared to accept that humans evolved over time, if at the outset they are given the chance to say that God had a hand in the process. But if that choice is not given, only 32% can accept the idea of gradual evolution. In Darwin’s British homeland, which is generally a more secular place, sentiment is confused and confusing. Puffin Books, a children’s publisher, chose Darwin Day to issue a kid-friendly edition of the scientist’s seminal work, the Origin of Species, and commissioned a poll to find how today’s Britons feel about evolution. Only half the respondents felt certain that the theory of evolution was true, while another 19% reckoned it was probably right. Hard-core creationist belief (defined as thinking creation happened all at once) was professed by 12%. People aged 29 or under were roughly as cautious as their older compatriots; 68% of the younger lot felt that evolution was certainly or probably right, against 65% of those aged 60 or over. And the idea that a higher power influenced the process, either gradually or all at once, was accepted by 26% in both age cohorts, according to the study by Ginger Research. Nick Spencer of Theos, a think-tank devoted to religion, notes that whatever is making young people cautious about accepting Darwin, the main factor cannot be messages they are receiving in places of worship (which very few attend) or the influence of fundamentalist schools, which form only a tiny segment of British education. In the Catholic and Anglican schools which account for a much bigger sector, Darwin’s ideas have been fully accepted for many decades: any teacher who deviates from that line will attract controversy, but the number of such cases is quite low, in Mr Spencer’s view. One worrying finding of the British poll is that nearly 30% of people had no idea that Darwin had come up with the theory of evolution and 9% credited him with dreaming up the theory of relativity. Levels of ignorance were higher among young adults than seniors. Perhaps homo britannicus is evolving in the wrong direction. Next PostNext Which songs stick in your mind?